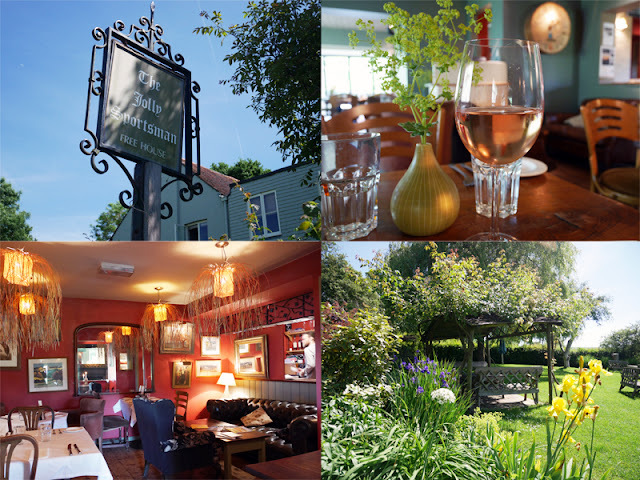 Set in a quiet little nook of Sussex in East Chiltington, Lewes, The Jolly Sportsman has always boasted pretty decent feedback and received two AA rosettes along with recommendations in the Michelin and Good Food Guides. It's a lovely big pub, painted in a perfect shade of grey and they have hit that sweet balance of modernisation whilst retaining the comforting feel any pub should have. The bar area is small but this is the result of punters being drawn to the food I imagine. And although they obviously have a car park, I thoroughly recommend working up an appetite with a walk. Following some darn good Twitter advice, I parked the car near Lewes Prison (safe!) and found the footpath that leads up to Blackcap Hill. Then through dappled light forest all the way back down the hill all the way to the village. It's a decent 1 hour 45 minute yomp, but it's a lovely way to get there (apart from being chased by a cow and a call for AA car rescue - another story and both separate incidents). Admittedly this feels more restaurant than pub, which to me isn't a problem. There's a quirky red room with raffia lighting, or a smart dining area. The outside is just glorious though, beautifully planted with sheltered tables set far enough away from one another to discuss your juiciest gossip without fear of eavesdropping. 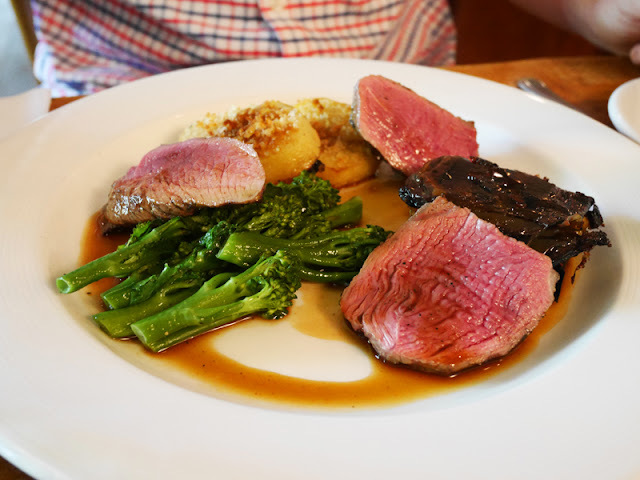 There is a fixed lunch menu at £15.90 and £18.90 for a 2 or 3 course respectively, but we were going whole hog with the a la carte. As you'd expect from any gastro pub (do we still call them these??) the menu is peppered with our sensational Sussex produce. "Duck, Duck, Duck" included, unsurprisingly, three elements of duck. A duck meat filled croquette, fois gras and a crispy duck egg. Big on flavour and glorious fatty richness, the dish was a great celebration of the bird. 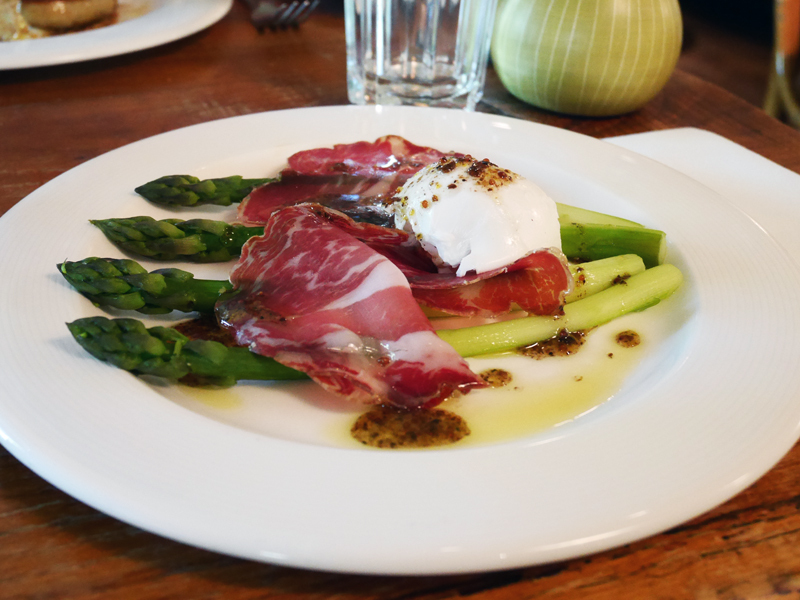 My Sussex asparagus dish was paired with coppa ham instead of the usual parma, a fattier cut that I think works better, far easier to cut and eat. A wobbly poached egg is the classic accompaniment but the addition of the truffle vinaigrette really make the dish pop. I'm obsessed with truffles admittedly, but having never seen it with this dish, I'll always be wanting that fragrant earthiness hit with it again. Mains continued to impress. 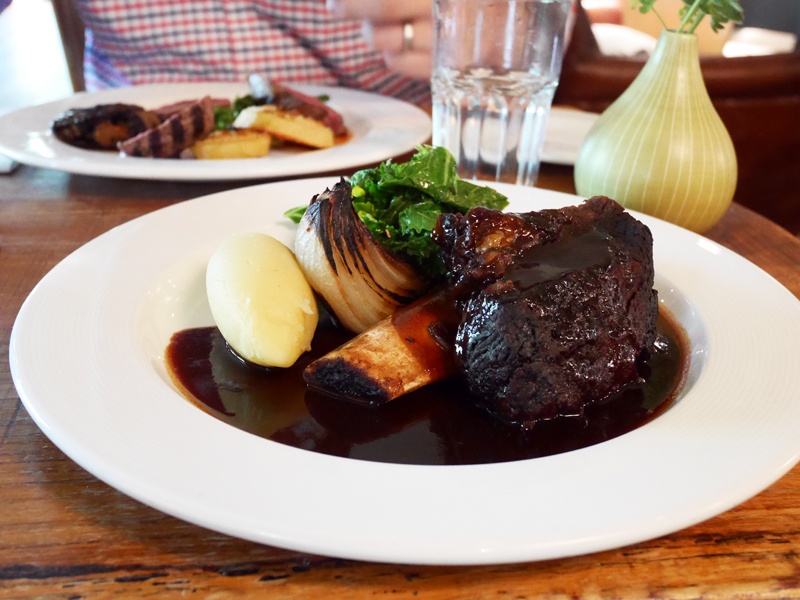 My red wine braised Sussex beef short rib was the best I've ever eaten, hands down. The bone was there for decoration because that decent hunk of meat had left it a long time ago in the slow cooking, resulting in succulent, juicy and deep flavoured meat. The red wine jus was reduced to an almost Marmitey intensity. Spring greens and a perfect quenelle of horseradish mash was all this rich dish needed along with a lovely charred onion wedge. I'd eat this dish a hundred times again. Probably in a row. The small piece of lamb rump I managed to extract from my husband's far lighter plate was also exceptional. I loved that they had given it a summery Mediterranean twist with a stuffed aubergine bake—a vegetable that seriously loves lamb—slices of olive oil potato and tender stem broccoli. 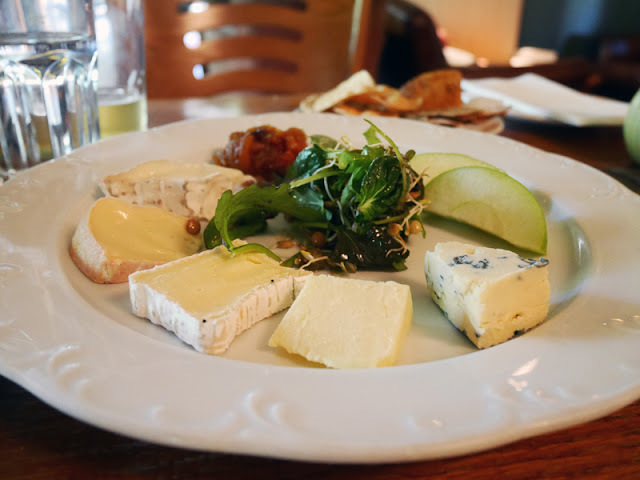 We interrupted desserts with a plate of ripe cheese which included Keen’s cheddar, Tunworth, Oxford Blue, Golden Cross, Golden Cenarth and was served with homemade bread, delicate flavoured crackers and a nicely punchy chutney. 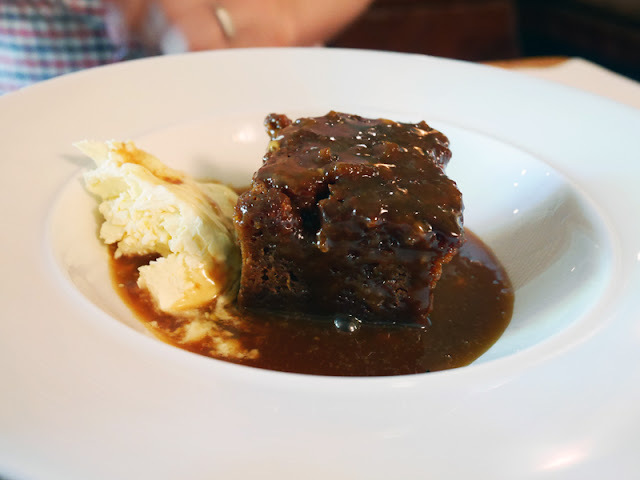 Warm, perfectly spiced gingerbread cake was a welcome spin on the classic sticky toffee, served with plenty of sea salt butterscotch and clotted cream. It was becoming apparent that these really are pub classics but refined and reworked to an exceptional level. 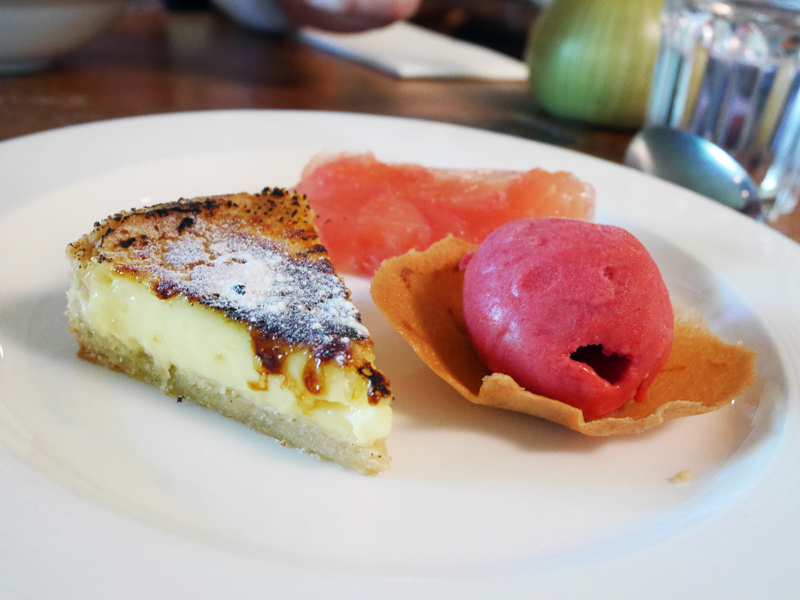 My lemon tart was refreshing, zingy and light, helped with a raspberry sorbet. Although I'm on board with anything with pink grapefruit in, I think this element should have been more delicate. The slab of over gelatined jelly had large, fleshy chunks of grapefruit that wasn't the greatest texture in the World. But hey, that's the only negative of the whole meal, along with the use of a comic sans font for the menu *grinds teeth*. Service was man-bunned, informal, friendly and pitched just right for the place. We paid around £100 for our meal which included a couple of good ales and a large glass of really delicious wine which think represented good value for the quality of cooking. "Fine cooking, not fine dining" is how they describe their food and I'd agree with that. I think overall this may have been the best pub meal I've ever had, big on quality and refined elements but above all else, a really memorable good feed.